Two days ago I hit a personal record. I had two interviews published on the same day. I can tell you, this is a nice feeling. This is one of them. You can read the first one where I talk about everything here: Interview & Portfolio Feature – The Dezineer and this is the second one. Shorter than the first and much more technical, you can find out about my gear and the equipment I use while shooting, my workstation, the software I use and how, plus other interesting things. And do visit the site http://fotoflo.ws/ where +Daniel Treadwell is building a collection of interviews with very interesting photographers. “Who are you and what kind of photography do you specialise in? 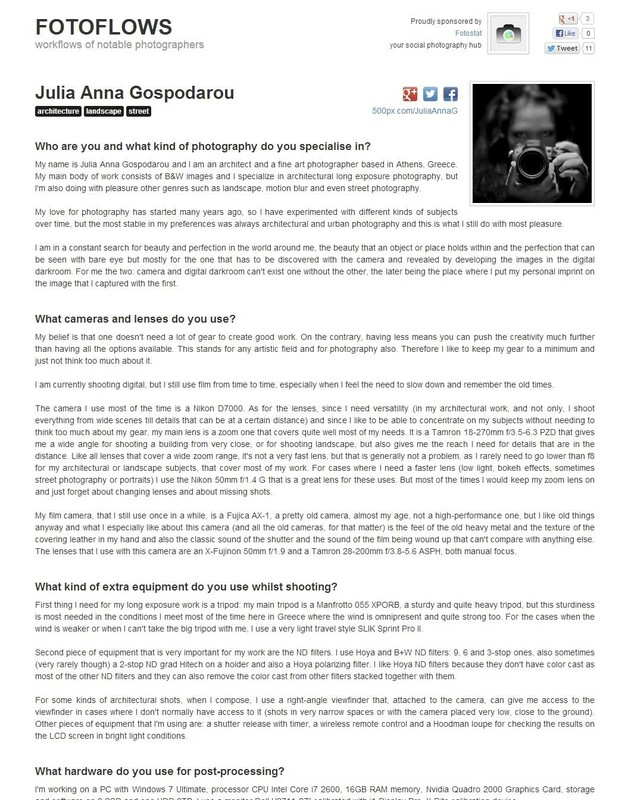 My name is Julia Anna Gospodarou and I am an architect and a fine art photographer based in Athens, Greece. My main body of work consists in B&W images and I specialize in architectural long exposure photography, but I’m also doing with pleasure other genres as landscape, motion blur and even street photography. My love for photography has started many years ago, so I have experimented with different kinds of subjects over time, but the most stable in my preferences was always architectural and urban photography and this is what I still do with most pleasure. for the one that has to be discovered with the camera and revealed by developing the images in the digital darkroom. For me the two: camera and digital darkroom can’t exist one without the other, the later being the place where I put my personal imprint on the image that I captured with the first. My belief is that one doesn’t need a lot of gear to create good work. On the contrary, having less means can push the creativity much further than having all the options available. This stands for any artistic field and for photography also. Therefore I like to keep my gear to a minimum and just not think too much about it. I am currently shooting digital, but I still use film from time to time, especially when I feel the need to slow down and remember the old times. The camera I use most of the time is a Nikon D7000. As for the lenses, since I need versatility (in my architectural work, and not only, I shoot everything from wide scenes till details that can be at a certain distance) and since I like to be able to concentrate on my subjects without needing to think too much about my gear, my main lens is a zoom one that covers quite well most of my needs. It is a Tamron 18-270mm f/3.5-6.3 PZD that gives me a wide angle for shooting a building from very close, or for shooting landscape, but also gives me the reach I need for details that are in the distance. Like all lenses that cover a wide zoom range, it’s not a very fast lens, but that is generally not a problem, as I rarely need to go lower than f8 for my architectural or landscape subjects, that cover most of my work. For cases where I need a faster lens (low light, bokeh effects, sometimes street photography or portraits) I use the Nikon 50mm f/1.4 G that is a great lens for these uses. But most of the times I would keep my zoom lens on and just forget about changing lenses and about missing shots. My film camera, that I still use once in a while, is a Fujica AX-1, a pretty old camera, almost my age, not a high-performance one, but I like old things anyway and what I especially like about this camera (and all the old cameras, for that matter) is the feel of the old heavy metal and the texture of the covering leather in my hand and also that classic sound of the shutter and the sound of the film being wound up that can’t compare with anything else. The lenses that I use with this camera are an X-Fujinon 50mm f/1.9 and a Tamron 28-200mm f/3.8-5.6 ASPH, both manual focus. What kind of extra equipment do you use whilst shooting? First thing I need for my long exposure work is a tripod: my main tripod is a Manfrotto 055 XPORB, a sturdy and quite heavy tripod, but this sturdiness is most needed in the conditions I meet most of the time here in Greece where the wind is omnipresent and quite strong too. For the cases when the wind is weaker or when I can’t take the big tripod with me, I use a very light travel style SLIK Sprint Pro II. Second piece of equipment that is very important for my work are the ND filters. I use Hoya and B+W ND filters: 9, 6 and 3-stop ones, also sometimes (very rarely though) a 2-stop ND grad Hitech on a holder and also a Hoya polarizing filter. I like Hoya ND filters because they don’t have color cast as most of the other ND filters and they can also remove the color cast from other filters stacked together with them. For some kinds of architectural shots, when I compose, I use a right-angle viewfinder that, attached to the camera, can give me access to the viewfinder in cases where I don’t normally have access to it (shots in very narrow spaces or with the camera placed very low, close to the ground). Other pieces of equipment that I’m using are: a shutter release with timer, a wireless remote control and a Hoodman loupe for checking the results on the LCD screen in bright light conditions. What hardware do you use for post-processing? I usually make 2 back-ups of my files, even if I’m a little behind with the second one at the moment., and I back up my files every few days to a week, according to the volume of work. What software do you use for post-processing? I use Lightroom to import my files and do the first general adjustments and then I export to Photoshop where most of my work is done. If the processing I need to do is not extensive I might do everything in Lightroom, but in the case of more elaborate images and for the best part of the B&W ones I use mostly Photoshop and NIK Software to do the processing (NIK Silver Efex Pro2 for B&W images), switching back and forth between the two. Then, when everything is done, I go back to Lightroom to export my files as JPEG for web use. I don’t usually print my images myself, I prefer sending them to a specialist in the field, Jeff Gaydash, so I can be sure I’m getting the highest print quality. What is missing from your current workflow?